Forecast to be quite windy in the Fraser Valley, and possibly overdeveloped, so it was time to head to Blanchard! It was pretty quiet on launch but Matty and Roger were already in the air and heading south...Matty was planning on flying to Tiger but we shortly afterwards heard him saying he had landed and was on his way back to Blanchard for another flight. Despite the nice-looking clouds locally, it wasn't an easy climbout. The good clouds were actually set quite far back, over Oyster Dome, and I decided to bail on my original plan to try to fly to the Skagit airport to the south, over the flats, which usually needs some clouds closer to the coast for that route to work. 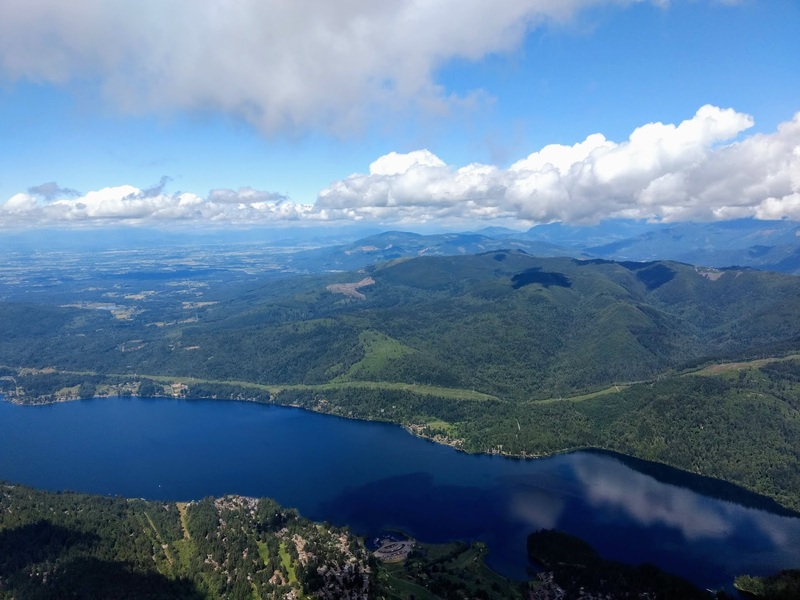 Flying over Lake Whatcom. Alex took the northern route; I took the southern route. Photo by Alex Raymont. Cloudbase was originally a bit on the low side, barely 1100m, but it was slowly going up and the overdevelopment inland was slowing drying up, so Alex suggested it may be a good time to fly to Big Johnson. 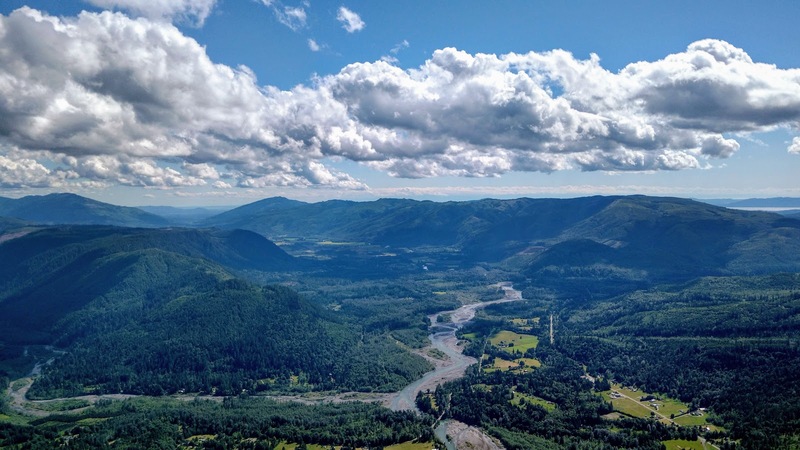 I have never flown over the back in that direction, in fact the only time I've flown over the back of Blanchard was to go to Sedro-Woolley to the SE, and everything I had seen of the first transition made me think it was not going to be a gimme. 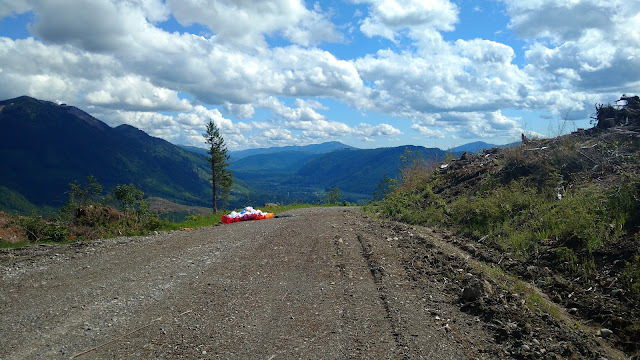 As you go over the back over Lake Samish to Lookout Mountain there are not that many good LZ's if you sink out, and then the glide over Lake Whatcom is even more committing! Alex and I took different lines over Lake Whatcom...Alex went north while I went south. I chose the south route since it gets you to the steeper slopes on the other side, but with less fields to bail out into on the extreme south end of the lake, and I wasn't sure about the more shallow slopes to the northern end of the lake. Alex's route to the north put him on the flatter slopes but there are more LZ's to choose from if you don't make it up. Over BJ, looking back at the route from Blanchard. Fortunately the clouds were drying up nicely and cloudbase had risen to to 1600m as I arrived on the east side of Lake Whatcom and was able to get high enough to see over the back, where I was greeted with the sight of large agricultural fields and a wide-open valley. Phew! At least now I was in the proper valley with BJ visible in the distance, and an easier retrieve now. Toplanding in the cutblock above BJ launch. One more jump across Comar to near Porter Mountain and then I was within glide of BJ, where I could see some pilots launching as the clouds were clearing above. Alex had landed at the base of BJ after taking the northern route and missing a climb, and was on his way up to BJ for another flight. I was feeling it was time to land, and after overflying BJ I realized the cutblock directly above launch was landable with a beautiful into-wind road to land on. Drove down Tom's truck so he and Alex and Robert could get another flight in, while Matty had relaunched from Blanchard, flown to BJ, continued on to Black, and landed on his was back. 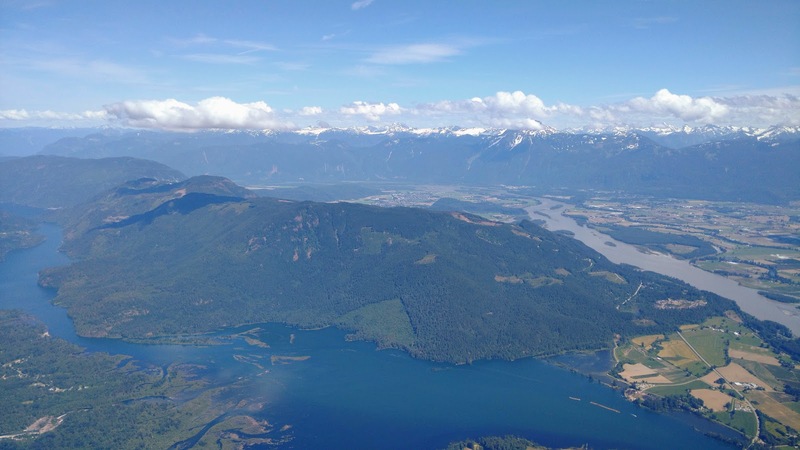 Meanwhile over in the Fraser Valley it was reportedly quite windy and raining and definitely not flyable, so I think it was a good choice to pick the coast for an earlier flight and stay away from the FV which can act as a firehose on strong wind days. 43 km flight from Blanchard to BJ. Another beautiful day in the Fraser Valley, and since it was a Saturday, the crowds were out! It didn't really turn on until closer to 1pm, but once in the air it was easy to get to cloudbase at the towers around 1600m. Originally I had thought about going to Banjo, but Alex suggested the west wind would make getting back from there difficult so we crossed over to Sasquatch with Vlad. 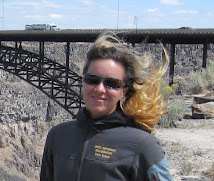 The wind wasn't so bad at Sasquatch but it was definitely there and increasing the further west we flew. Alex and Vlad were a thermal ahead of me after I missed a climb they had gotten earlier, and they were reporting quite windy and trashy conditions at Big Nic, and in fact had turned around on the way to Dewdney. So I decided to turn around at Big Nic and return to Woodside, and once back there the west wind had disappeared, and I could just see it barely starting up on Harrison Bay. Crossing back to Woodside from Sasquatch at 1800m. High cloudbase! Since there was still lots of daytime left and the car was now over at Bridal Falls Alex and I flew over to the Bridal side along with Peter Spear, who had already done a Woodside-Bridal-Woodside flight, and was on lap #2 (!). 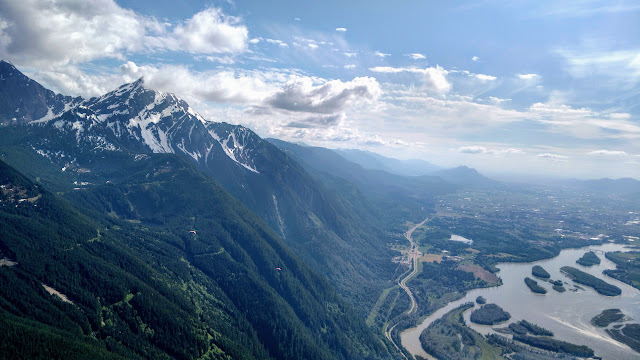 The Fraser River was still quite high and no landings on the Bridal side except for the powerline triangle, but we arrived with plenty of height and the flying conditions were *much* nice on the Bridal side! Cloudbase was around 1900-2000m and pilots were all over the place at Cheam, the Lakes, Archibald, Upper Bridal, and Gloria. There was practically no wind (the west wind hadn't yet arrived on the Bridal side) and at times my GPS actually said it was light east or north wind aloft! It was quite the change from the Woodside side and it was nice to relax a bit and cruise the ridge at Bridal and not have to worry about recrossing back to Woodside. I think many pilots did do the crossing, although I also heard some pilots landed at Seabird Island after getting too low to make the crossing to Bridal with any comfort. Over on the Bridal side where the flying was much cruisier! The west wind never really got to Woodside or Bridal and it would have probably been a good day to try flying to Hope and return!